Natural gas is one of the most volatile energy markets out there. Since natural gas began to trade on the New York Mercantile division (NYMEX) of the Chicago Mercantile Exchange (CME) in 1990, the low price has been $1.02 per million British thermal units (Btu's) and the high price has been $15.65. On August 21, 2015, the active month September natural gas futures contract was $2.687, which is low on a historical basis. The price of natural gas futures is highly sensitive to weather. 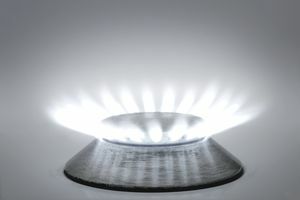 Over recent decades, many homes in the United States have replaced oil-based heating systems with natural gas-based ones. This has increased demand for the energy commodity and has made it a seasonal commodity that tends to peak in the winter. When an unusually cold winter hits the U.S., the price tends to move higher. Over the course of history, natural gas prices often move quickly and violently. We witnessed this most recently during the winter of 2013/2014 when the price of active month natural gas moved from just over $3 to highs of almost $6.50 as a result of frigid conditions in the U.S. There is a seasonality factor in the natural gas market, it has tends to peak during winter months and fall during warmer months. The all-time highs in gas occurred back in 2005 and 2008 when hurricanes hit natural gas storage and infrastructure along the Gulf of Mexico in Louisiana, the delivery point for the NYMEX futures contract. There have been many changes to the natural gas market over recent years. The discovery of huge reserves of natural gas in the United States in the Marcellus and Utica shales has depressed the price. The advent of hydraulic fracking to develop and extract gas from those reserves has increased supplies and depressed price. However, there are currently a number of important changes going on in the energy market that could mean that the natural gas price will head higher in the years ahead and prices under $3 per mmbtu will become a cheap and distant memory. While an increase in reserves of a commodity is not positive for the future price path, there are currently three reasons that natural gas could be very cheap at the current price level. Energy policy in the U.S. has been changing to deal with the problems of pollution. In a recent speech, the U.S. President announced a number of initiatives to decrease carbon emissions in the environment. This amounts to replacing all coal with natural gas powered power plants to produce electricity. This will increase demand for natural gas on a year-round basis considering that cooling requirements are a function of electricity demand. The transport and distribution of natural gas around the United States occurs via a pipeline network. New technology, developed by Cheniere Energy (Symbol LNG), to liquefy natural gas will allow and facilitate the export of natural gas supplies abroad. The price of natural gas in the United States is much lower than it is in Asia. Liquefied natural gas carried by ocean vessel around the world will expand the addressable market for the commodity thus increasing demand and off-take from U.S. supplies and reserves. The technology, therefore, is a positive for the future price of the commodity. Fracking for natural gas has increased the number of seismic events in areas of the United States where natural gas reserves are present. The number of earthquakes in Texas, Oklahoma, Ohio and other regions has increased which is likely the result of fracking activity in these regions. It is possible that new regulations will decrease or change this method of extraction for natural gas. That could inhibit natural gas production from levels previously assumed by market analysts. Due to the three reasons listed above, natural gas futures at below the $3 level today are cheap. Therefore, the downside risk for natural gas from its current price is limited and the upside has become a lot more interesting.